The year 2016 has been a terrible year for Samsung & apparently, everyone in the world knows why, but if you are still wondering then it’s the Note 7 Explosions fiasco that has hit them to the core. They had to eventually discontinue the product itself and focus on the other products that have already been doing well. But today we have come through a very ironical situation where a customer who had purchased the Galaxy S7 Edge Smartphone, the brand’s current best product was broken. When he was even ready to pay for getting the shattered display fixed, he was denied that. Let’s read more about this issue & how it’s handled. Sol Rieger had purchased the Galaxy S7 Edge a few weeks back, and that got dropped with the screen cracking into thousand of pieces. Of course, anyone would just connect with the respective manufacturer to know more about a solution on the same. In this case, when he got in touch with the Samsung Support, he was shocked to receive the following response. If you have ever purchased an Apple product, you will vouch for the excellent service they offer which is why people extend the same through the Apple Care program, but the response from Samsung was surprising. 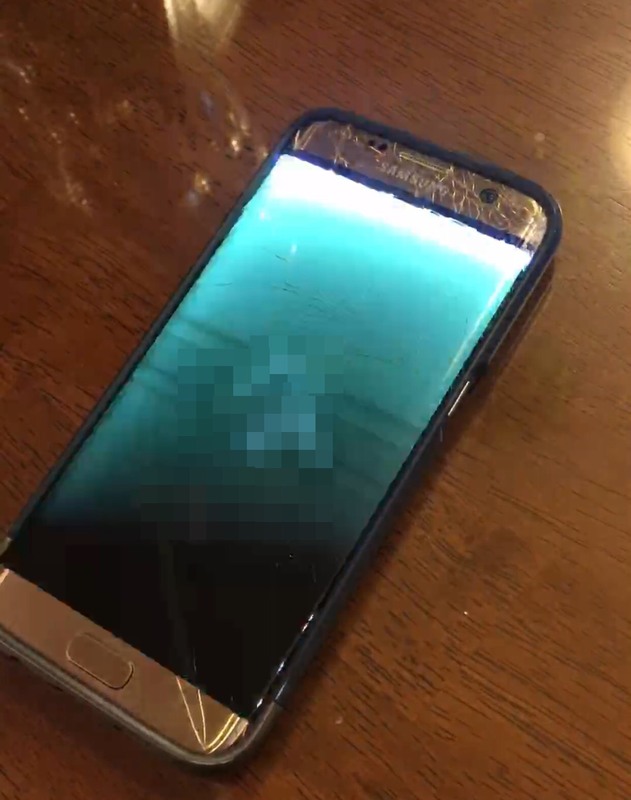 While the customer was ready even to pay for getting the display fixed, he was told that “Due to current conditions, Samsung is temporarily suspending all Out of Warranty repairs. We apologize for any inconvenience this may cause”. This was responded by a person called “Terry” from the Samsung Support Team. There’s a TAT (turn-around-time) of 10 business days generally for the S7 Edge which is officially made by Samsung, but denying is something that we are seeing it for the first time. Asking for a new screen replacement is something that a customer might expect for free considering that they have paid a premium for the flagship product and Samsung has been offering free screen replacements in a few selected places when the Note 7 recall happened. But denying even a paid service is completely unexpected and something which is a new. What kind of business conditions is Samsung referring to in this case? Is it that they have made massive losses because of the recall and they cannot offer a paid service? 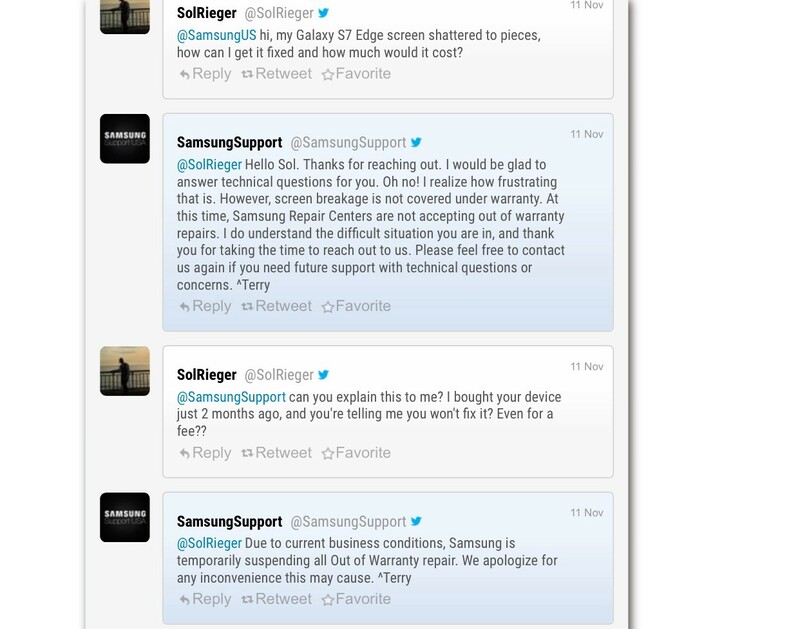 The display of the S7 Edge costs $269 officially, and Samsung could have just quoted this & went ahead making the customer happy but denying any service is completely unacceptable because now the only solution is getting it fixed through a third party service or doing it himself by getting the display imported. But for some odd reason Samsung doesn’t think that they should offer the service of repairing their own devices, but no worries, if I do fix it by some local shop the phone will lose its warranty because it needs to be fixed by… whom exactly? Samsung won’t fix it for me, so I guess the best option is to fix it by some local shop and then lose the warranty. Sorry to say, but I find this very cynical, and if this story would’ve happened by anyone else, I would’ve never believed it. This is beyond comprehensible- that in 2016 a company (especially one as big as Samsung) should be running from their devices faster than a cheetah runs after its prey. What do you think about this current scenario? Tweet this article to @SamsungMobile & let us know what they have to say about this incident & why would they deny an Out of Warranty repair? Note: The featured image added is the Samsung Galaxy S7 which was captured during our review of that phone.